Knitting yarn has very limited outlook on life. There are certain high points in its existence: the first of which is to bewitch a passing knitter with its qualities of colour, luster and feel. It will cleverly seduce you, persuading you that life apart from this particular skein of yarn would be an unbearably bleak existence. So you make the acquisition and take the treasured skein home. This is, indeed, a great day. Once home, the skein settles in, possibly with a few soft companions. Life is good. Now the waiting game begins: restiveness amongst the yarn buddies begins to occur. Whose turn will it be next? A certain amount of surreptitious fiber shuffling may occur under the cover of darkness to facilitate optimal positioning to the top of the stash pile. Ah, patience is required. The great day dawns, the skein of yarn is lifted from the pack and taken to the swift for winding into a center-pull ball. Hallelujah!!! All’s well with the world. Or, less fortunately, the skein is wound into a cannonball style presentation. The yarn feels a painfully stressed by this turn of events, but consoles itself that it will be knit soon. Knitting proceeds, and the yarn perceives itself more on an individual stitch by stitch basis rather than collectively as a skein. The mid-row stitches are ecstatic! The end of row stitches rather less so, but it’s better than being stuck in a cupboard. As the project progresses, the remaining yarn begins to worry: is it not going to be required? Will it end up with a life sentence in a drawer, with slim parole options? Or, horror of horrors, will it be the bit that is used for sewing up? No wonder it is anxious! Sewing with yarn spun for knitting can be painful for both the sewer and the yarn. Most knitting yarn is woolen spun (as opposed to worsted spun), which, for the sake of brevity, means it is much less suited to being dragged in and out of a hole. It has more little fiber ends near the surface of the yarn and so can become draggly and weaken quite quickly. Then there is the knitter’s tendency to use huge, long lengths of yarn to sew with (in order to avoid a couple of additional yarn tails). Sadly, the longer the yarn, the more times it has to be hauled through the fabric before it is used and the more the plies tend to untwist. From the knitter’s perspective, too, it takes just as long to haul through yards of yarn, to periodically re-twist the decomposing yarn, and every so often undo a tangle or knot in the sewing yarn as it takes to use two shorter (happier) lengths of yarn. Leave yarn tails unfastened and dangling outside the work until you are happy with your seam. This way, if you don’t like a section, it may be pulled out easily. If the yarn becomes un-plied as you sew, twist the needle periodically to retwist the plies. Use the working yarn for grafting and visible seams, but consider using a finer, similarly coloured yarn for mattress stitch seams. I’d suggest using a similar fiber type as the original yarn. If you have any supplies of crewel wool (it’s worsted yarn spun in a million shades), they can be useful for sewing up wool garments. Remember that the pinnacle of life experience for a piece of yarn is for a little loop to be gently drawn up through another welcoming loop of yarn. So knit on, my friends! 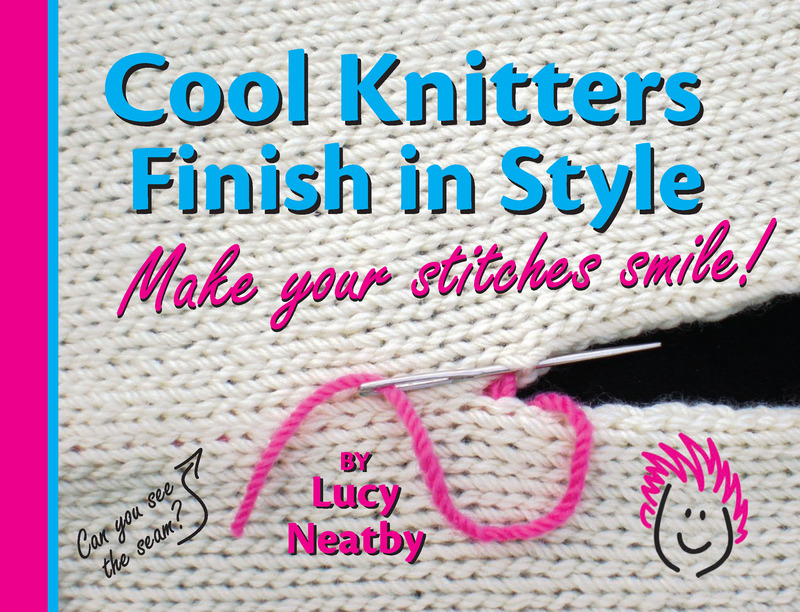 For more advice on finishing (and rescues), from before you cast on to the last tail to be darned, read my book Cool Knitters Finish in Style. It’s still available in paper and also in digital format. A pair of matching Paradoxical mittens. Here’s a Knitting Hint: Dare to compare! When you are debating with yourself about the very best way to hold your yarns or knit up stitches, the most suitable decrease or buttonhole, or any of the other myriad of choices we face as engaged knitters, take a little time to play. Try the various methods open to you. Practice them in close proximity so you can directly compare the results. Private side comparison of two Paradoxical mittens. Making a small swatch, looking at it, ripping it out and then redoing it another way won’t give you the necessary comparison. It is not a truly useful experiment. I love it when at workshops the cry goes up: “My goodness, you are right!” It’s not that I’m on a power trip, wanting everyone to do things my way, but I do like knitters to explore their options and come to their own conclusions. If it happens to be the same one I reached, that’s cool, but it doesn’t have to be. Different techniques work differently for different people. Occasionally, there is no ‘right’ answer — only the one best suited to you, your yarn and your knitting circumstances. Experimenting with the options available to you is fun and educational: that’s why I included the small “Challenge Swatches” at the end of each chapter in my Cool Knitters Finish in Style book, inviting you to try a variety of methods and draw your own conclusions. Be curious: play with your stitches, make them smile! Paradoxical Mittens: feeling right at home on Big Tancook Island! The Paradoxical Mittens are on sale for half-price this week only! Before you begin your project, try working with the dark yarn as the contrast in one swatch and the light yarn as contrast in another. See the difference? 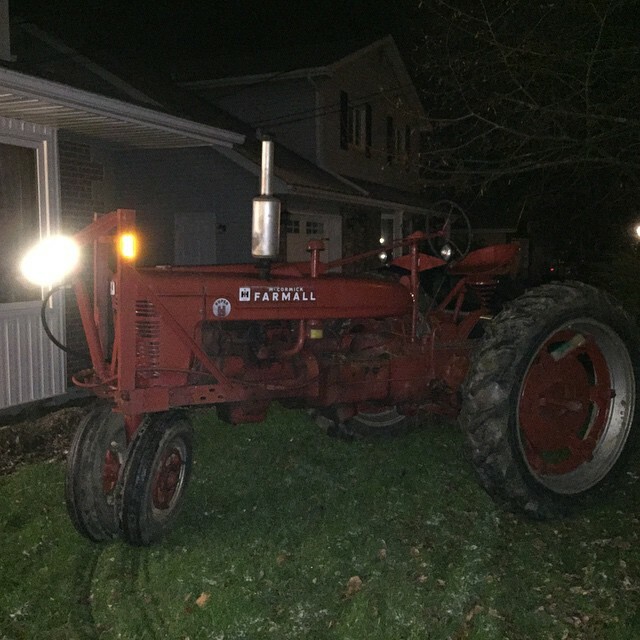 This year’s Christmas Tractor has arrived! We enjoyed a lovely Open House for our local knitters on Saturday afternoon. I was happy to see some familiar faces, and loved meeting several new-to-me knitterly friends. All in all, a huge success: the BOGO sales were enthusiastically embraced, Holly’s cookies greatly appreciated and many of us took the time for a bit of knitting around the kitchen table. 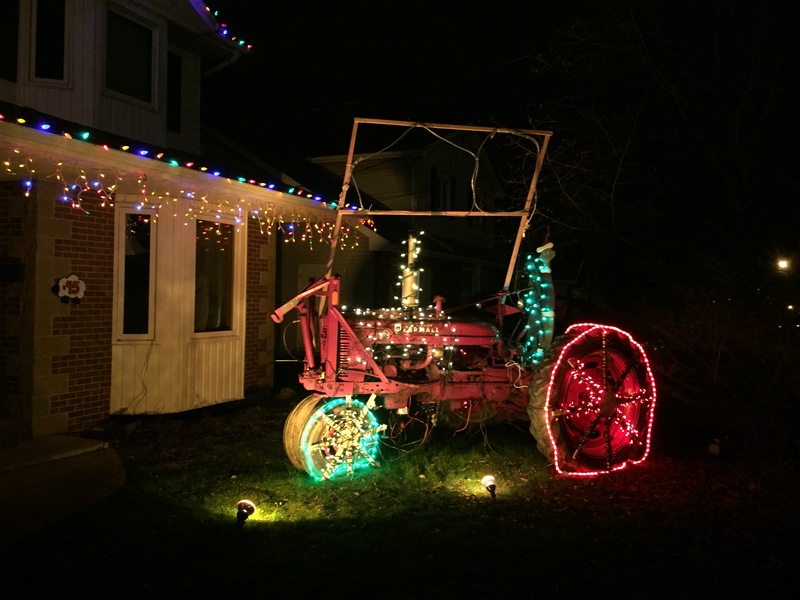 John had started decorating the Christmas Tractor, which was greatly admired by all. We didn’t forget our Online Knitting Community and, with all of you in mind, have baked up a few low-cal Holiday treats at the website, as well! From now until December 14, check out our Holiday Sales Bundles! Most of these include two of my “Learn with Lucy” titles at 40% off paired with an appropriate free pattern. We’ve also included an eBook special, featuring my three digital titles: Cool Socks Warm Feet, Cool Knitters Finish in Style and A Little Book of BIG Holes for HandKnitters! And finally, I’ve introduced a new Sale Concept this year: my Online Advent Calendar will feature one of my downloadable products every day between now and December 24th. Please note that each Daily Advent Calendar Deal will be available for 24 hours only, so check the Newsbox often. 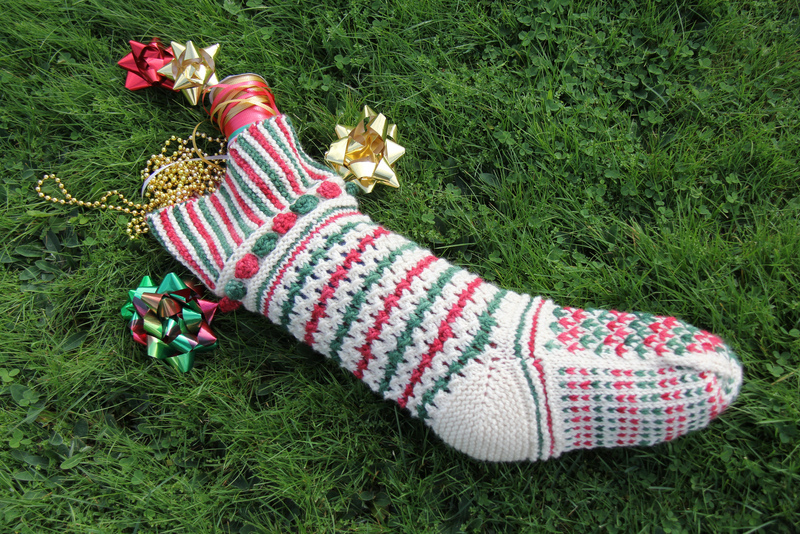 To start the month off right, today’s item is my Fiesta Stocking pattern: you’ll have plenty of time to knit one before Christmas if you start now! Wishing a Happy Start to the Festivities to you and yours! I’m looking forward to a busy month preparing for family visits and all of the Holiday excitement. The countdown has begun! PS Poseidon the cat will be choosing a winner of Holli Yeoh‘s new Tempest Knits book later this week. We were happy that the book weighed in at just over 400g, which put it into the category of an oversized letter, provided we didn’t pack it in a padded mailing envelope which would make it too thick for this class. Letter shipping would then be $7.00 per book to the US. Mailing by this method, the envelopes could then be run through the postage meter before stuffing. But would this envelope protect the book sufficiently? In order to try to prevent damage, I looked for heavier paper envelopes but came up empty-handed, so decided to fold the excess envelope over and tape the envelope end for end and side to side for protection, and then to hand the fate of the package over to the whims of the postal gods. Remaining under 500g but with a padded envelope would boost the price to $9.50 (plus the envelope cost), and if that made it go over 500g, it would become the next category of small packet at $14.50. An additional cost of small packets over letter mail is that all small packet mail has to have the address and mailing information re-entered into the Canada Post shipping program. We have not been able to find a way to enter this data into our accounting software (Quickbooks) and then to share it with Canada Post. Canada Post’s software is quite remarkable: with every upgrade it becomes more cumbersome and difficult to use. Working with Apple products has evidently spoiled me! Did your book arrive in a satisfactory condition? Would you have liked the option to spend more on shipping for a padded envelope and the consequent increase in postage rate? I hope you feel that we have made the right choice for you. I felt that spending $10.50 to have a $19.95 book shipped is not what you would like. 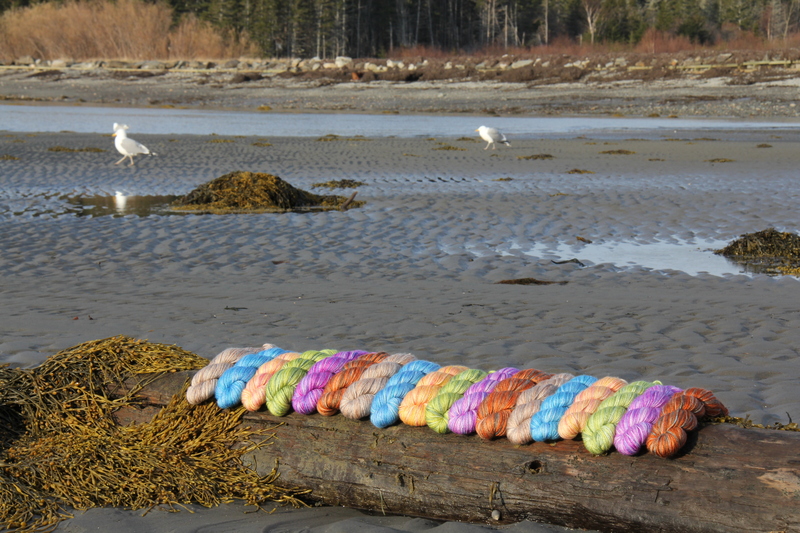 If you are lucky enough to have one, please support your local yarn store and save on the shipping. This book is also available in a green and economical format as a .pdf, either directly from us or from Patternfish. Save time in line with gift-purchasing: we’ll be happy to send your gift of the book to third party recipients on your behalf. Thank you for your support and Happy Thanksgiving stitches to our US readers.